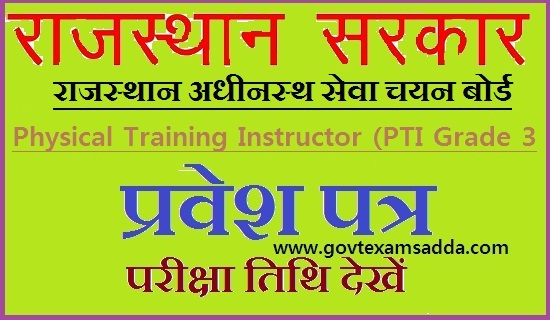 Rajasthan PTI Admit Card 2018:- The Rajasthan Staff Selection Board release a notification to recruit 4500 3rd Grade Physical Training Instructor vacancy. Now the authority has been released the RSMSSB PTI Admit Card 2018. Applicants who successfully submit their PTI online application form, Now they can easily download their Rajasthan PTI Hall Ticket 2018. Aspirants can tune here for latest update. 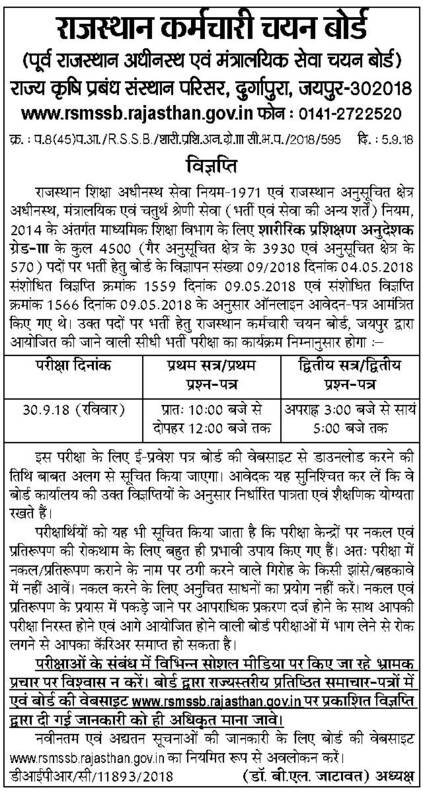 The RSMSSB will be going to conduct the 3rd Grade PTI Examination on 30th Sep 2018. Candidates who have filled their form successfully only they are eligible to access the RSMSSB PTI Admit Card 2018. As per the latest news, the Rajasthan PTI Admit Card 2018 has been released online. Applicants can get their Physical Training Instructor Hall Ticket via online mode. They can take help to access the RSMSSB PTI Call Letter through registration ID and DOB. The examination cell release official update regarding the RSMSSB PTI 3rd Grade Admit Card 2018. The RSMSSB announced that the PTI Exam conduct on 30th Sep 2018. The Rajasthan PTI Hall Ticket 2018 available on board’s home page. Aspirants may download his/her admit card from the official site and appear in the examination at the allotted examination center. Candidate should check our site for getting various latest information regarding the RSMSSB PTI Admit Card 2018. PTI Grade III Hall Ticket uploaded on 24th September. Aspirants can complete their study Exam Syllabus. They also write sample study plans and research Physical teaching. Moreover, along with the PTI Hall Ticket 2018, candidates also need to bring their identity proof and signature to the examination. So remind their Original ID Proof along with admitting card in the paper time. Applicants know that the Admit card contains the complete details about the examination like as candidate’s name, roll no, application number, exam Venue, photo & signature also. The Board will release the Rajasthan PTI Hall Ticket 2018 online only for the candidates who have to fill their form successfully. RSMSSB disclose the PTI Grade 3rd 2018 Admit Card as soon as possible. Candidates start their exam preparation by which they can crack the exam and secure their name in the selection list. Aspirants can check the RSMSSB PTI Exam Pattern 2018. through this, You can take a rough idea regarding exam like as total no of questions, exam marks, subject etc. These are the steps to download the Rajasthan PTI Hall Ticket 2018. You might be wondering that how can I access admit card. Firstly, Visit the Official Site i.e. http://www.rsmssb.rajasthan.gov.in/. Now click on the Admit Card/ Latest Updates tab (if Available these Section). Enter the required details correctly without any mistake. download the RSMSSB PTI Call Letter 2018. Finally, Get/Download the Physical Training Instructer Hall Ticket/ Call Letter. Applicants are ready to access their PTI Grade III Admit Card 2018. They also carry the User ID, DOB or Full name during the downloading of RSMSSB PTI Admit Card 2018. The Rajasthan PTI Call Letter is a necessary and crucial document to enter the examinations hall. If any candidates have facing problem to access their Raj PTI Hall Ticket then they comment us.